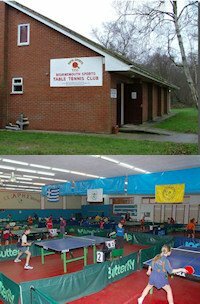 The Green Mountain Table Tennis Club (GMTTC) was organized in 1983. The club has been actively involved in promoting the sport of table tennis continuously since that time. The club currently runs its operations at the Knights of Columbus on Merchants Row in Rutland, Vermont (USA). Club membership varies from year to year and ranges in age from as young as 10 years of age to as mature as 70 years plus. Both women and men are welcome. Members travel from as far away as Manchester, Burlington and New York state. Skill levels range from beginner to near expert. Boys & Girls Club members make up a small portion of the club membership, as our club has a partnership with the BGC. Club members enjoy the services of dedicated and talented coaching by some of the better players in Vermont. On average, 16-18 players are in attendance at each Regular Season practice, and 6-8 players at each Summer Season practice. The Knights of Columbus/BGC gym configuration and excellent lighting make it very suitable for table tennis play. The club owns 8 Butterfly tournament-quality tables, Nittaku and Butterfly nets, 2 Newgy Robo-Pong robot ball machines, score keepers, barriers, a sound system (for tournaments), several practice paddles and provides both practice and tournament level balls for practices and other events. The club also owns a growing library of instructional books and video tapes on the subject of table tennis techniques and strategies. The club has its own storage room (the “Pro Shop”), and has keys to the entire complex, sets being provided to its most responsible members. Beautifully designed club shirts are also available for sale. 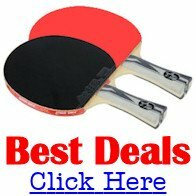 The Pro Shop has many table tennis supplies for sale, at cost, to the members. The club’s income is derived exclusively from dues, tournament fees, donations, and, at times, sponsors. The club’s primary expenditures are for equipment purchases, facility rental fees, tournament and interclub expenses, and administrative costs. The club also generously supports various programs wherever they have played, through a year-end donation to demonstrate the members’ appreciation for the privilege of utilizing facilities at their venue for club activities. Membership fees are $30 per full season; dues are reduced each February 1st for the remainder of the playing year (through September). After February 1st, the annual dues are reduced $10 from the normal level and cover the duration of that season. Family memberships are also available. Visitors and prospective members may attend 2 sessions at no charge, thereafter they are subject to paying for a full membership or $3 per evening of play. Only Boys & Girls Club members and their staff are not required to pay dues or tournament fees. Any of the club officers can assist you with further information about the GMTTC. Be sure to visit the club’s web site for a thorough explanation of club activities.